Statue of the famed Rocky Balboa character from the ‘Rocky’ film series, shown here in the early 1980s, in its much-disputed ‘top-of-the-steps’ perch at the Philadelphia Art Museum, looking out on center city. Photo, Vicki Valerio, Philadelphia Inquirer, July 1982. In 1982, Sylvester Stallone, Hollywood movie star and producer of the Rocky film series, donated a statue of his Rocky Balboa character to the City of Philadelphia. The statue was left near the entrance to the Philadelphia Art Museum, where it touched off a 20-year controversy over its location and artistic merit. In the first Rocky movie of 1976-77 — which won the Academy Award for Best Picture — Rocky Balboa, South Philly’s “Italian Stallion,” is a down-and-out heavyweight boxer who is unexpectedly given an opportunity to fight in a world championship bout. In his training for the big fight, Rocky runs the long series of steps that rise up to the entrance plaza at the Philadelphia Art Museum. The steps climb to a location that also offers one of the finest views of Philadelphia’s skyline. In the film, Rocky, the underdog and out-of-shape contender, does a daily, pre-dawn “battle with the steps” while the city sleeps. Rocky is “beaten” by the steps day after day, but he keeps at it. Finally, in one scene he triumphs — now becoming fit — shown sprinting to the top of the steps with energy to spare. Having beaten the steps and arriving at the museum’s plaza, he proceeds to do the “champ dance” with relish, arms raised in victory as the camera moves around him capturing the early morning city skyline over his shoulders. It’s a memorable film scene, and one that has survived in the hearts and minds of millions of filmgoers. Philadelphia Art Museum and its long series of steps rising to the main entrance - steps now nick-named `the Rocky steps' after the 1976-77 `Rocky' movie. In fact, even today, many tourists who come to Philadelphia go to the museum not for the art, but to run “the Rocky steps,” as they are called. Some of those Rocky imitators, reaching their goal, also do the “champ dance” at the top of the steps. There’s even a book about those who come to Philadelphia to run those steps, titled Rocky Stories. Back in 1982, however, when it came time to finally place the donated “Rocky” statue, the top-of-the-steps location seemed to be the obvious choice — but not for everyone. Poster from the first ‘Rocky’ film with Rocky celebrating atop Art Museum’s steps, looking out on the city. The 12′ – 8″ bronze “Rocky” statue had been commissioned by Sylvester Stallone in 1980 for use in a subsequent Rocky film — Rocky III, which came to theaters around Memorial Day, 1982. In the film, the statue makes its appearance atop the museum steps as part of the film’s storyline when the fictional Rocky champ is honored by the city with a statue dedicated to him at that location. At the completion of the filming for Rocky III , Stallone left the statue in place as a gift to the city. As noted above, the top-of-the-steps location at the Philadelphia Art Museum is a choice spot, offering a commanding view of Eakins Oval at the bottom of steps directly in front of the museum (named for Philadelphia resident and artist Thomas Eakins) and the Benjamin Franklin Parkway stretching out toward Philadelphia City Hall. The Rocky statue remained at this location in 1982 for several months following its use in the Rocky III film. And that’s about when the debate erupted over whether the statue at that location was boon or bane, art or something less than art. Rocky statue in 1982, atop Philadelphia Art Museum steps. Some museum officials worried the statue could impugn the museum’s international reputation. But others saw a silver lining with the Rocky statue at the museum. “People who had never been inside the museum,” noted one observer, “at least got close to the entrance.” Still others found inspiration in the likeness, pride in their city, a booster for tourism, etc. So, a running debate over the statue’s location continued off and on over the course of 20 years, especially as the statue was moved around. The Rocky statue was moved to Philadelphia’s Spectrum in 1982. After it was left on the museum’s steps in 1982, the city considered various alternate locations. Several months went by, but the city then settled on an outside location at the front of the Spectrum, an indoor sports arena in South Philadelphia where the Philadelphia 76ers professional basketball team and Philadelphia Flyer’s ice hockey team then played. Rock concerts were also held at the Spectrum. Across the street was Veterans Stadium, home to the Philadelphia Phillies baseball team and Philadelphia Eagles football team. The Spectrum location seemed to make sense since this was the sports area of the city. So, in 1982, after a brief few months at the art museum, the Rocky statue was moved to the Spectrum. Photo at right shows the statue outside the Spectrum front entrance facing Veterans Stadium. The Rocky statue made a few ‘for-filming-only’ appearances at the Museum location, but remained at the Spectrum through 2002. Over the next decade, there were a few temporary filming excursions that brought the Rocky statue back to its museum location, one of which was the filming for the 1987 movie Mannequin with Andrew McCarthy. In 1990, the Rocky statue was again temporarily placed atop the museum steps for the filming of Rocky V. Renewed debate about the location ensued as well. In 1993-94, it was moved there briefly again for the filming of the movie Philadelphia with Tom Hanks and Denzel Washington. But afterward, on each occasion, the statue was returned to the Spectrum. However, one complaint about the Spectrum location was that it was too far off the beaten path for tourists; too far away from the Art Museum. Confused tourists couldn’t find it. In 2006, the Philadelphia Art Commission approved a location near the Museum for the Rocky statue. On September 8th, 2006, the Rocky statue was installed at its new location. The unveiling ceremony included live music, the debut of the first full trailer for the Rocky Balboa film, and a free showing of the first Rocky movie from 1976. A cheering crowd of a couple of thousand Rocky fans attended the affair, some traveling quite a distance to be in attendance. Film star and Rocky creator, Sylvester Stallone, with the Rocky statue at September 8th, 2006 ceremony installing the statue at its new location at the base of the steps to the Philadelphia Museum of Art. Jason Yun, 28, drove eight hours from Columbus, Ohio to attend the installation ceremony. He was among the first at the barricade surrounding the statue, having slept in his car. “I love Sly,” he told Philadelphia Inquirer reporter Michael Vitez. “He’s my hero,” Yun said. “He’s inspired me to change my lifestyle.” Pamela Weicht, 35, and her husband, Tim, 41, took the day off work and drove to Philly from Camp Hill, PA, near Harrisburg. This couple had played the Rocky III tune, “Eye of the Tiger,” at their wedding. Chet Jelinski, 51, a self-employed carpet cleaner from Bloomfield, New Jersey, and a loyal fan of the Rocky film series, also took day off to come to the event. This story is one in an occasional series that explores how America and other countries honor their icons — from famous politicians and military leaders, to movie stars, TV celebrities, and sports heroes. Societies have been erecting statues or otherwise commemorating their famous and beloved figures for thousands of years. But in modern times, even fictional characters, their ranks swelled by cinema and television, are now joining those up on the pedestal, some for purely commercial reasons. As statues and busts, the famous personages are typically cast in outsized proportions, some placed in parks or other public spaces. Still others are found on postage stamps, murals, buildings, near sports arenas, or used in various place names. Not all of those so honored, however, meet with public approval, though some have broad and continuing support. The stories offered in this series include short sketches on some of these figures — past and present — providing a bit of the history and context on each and how the proposed honor came about. At the ceremony, Mayor John Street said that the Art Museum steps were one of Philly’s biggest tourist attractions, and that Stallone, a native New Yorker, had been gladly adopted by Philadelphia. Stallone — who agreed to pay for moving and maintaining the statue — thanked the Mayor, the Fairmount Park Commission, and the Art Commission for allowing the statue to be moved to its new location. He also spoke to the crowd. “…Among the thousands who crammed into the green leafy area on the north side of the front steps of the Art Museum Friday evening, dodging rush hour traffic to see and hear Sylvester Stallone speak at the unveiling of the Rocky statue, I must have heard five foreign languages spoken by those who eagerly sought to get a glimpse. “I heard Chinese, I heard German, I heard what could have been Serb or Croatian, I heard Philippino…. “I’m not saying that Philadelphia isn’t a cosmopolitan city, but in my lifetime of walking its streets, I’ve never heard so many different foreign languages in such a short time. They were Rocky fans. And for the first time I realized in a personal way that Rocky belongs to the world, not just Philadelphia. A Philadelphia jogger does a ‘Rocky’ imitation on the steps of the Philadelphia Art Museum looking out on center city, November 2006. Photo, Ryan Donnell, New York Times. Click for Rocky Balboa poster with quote. By mid-November 2006, a few Philadelphians, including some with resume in the arts, were speaking pretty positively about the Rocky statue’s new location. Stephanie Naidoff, the founding president of Philadelphia’s Kimmel Center, a hall built in 2001 as home to the Philadelphia Orchestra, was quite upbeat about the Rocky statue’s value to the city. “It is unbelievable what an icon it is for visitors and residents alike,” she explained to New York Times reporter Robert Strauss. Naidoff by then was Philadelphia’s director of commerce. “There is no doubt that lots of people are now coming just to see the statue,” she continued, “– and then a good number of them are attracted to the museum. I can’t see any real downside to it.” Naidoff added that if the museum could showcase the wedding dress of Philadelphia’s famed movie star and princess of Monaco, Grace Kelly, then it could also have a Rocky statue outside. The fate of the Rocky statue may well have been debated in Philadelphia for more than two decades, but in one small Serbian village, a similar version the Rocky statue was received with opened arms. On August 18th, 2007, in the town square of the small Serbian village of Zitiste some 55 kilometres north of Belgrade, a ceremony was held dedicating a statue of the Hollywood boxing underdog. The village had experienced some hard times, was buffeted by crime, and was getting no respect. The town’s people were in some despair and needed something to feel good about. “For years, only negative reports on farm disease, monstrous murders, floods and landslides have been coming from our village,” explained Mayor Zoran Babic. The Rocky statue that now graces the village square of Zitiste is similar to, but is not a copy of the Rocky Balboa statue at the Philadelphia Art Museum. Earlier base plate on the Rocky statue with inscription: "Thunder In His Heart. The Character Who Represents The Courageous Spirit of the Great City of Philadelphia And The Brotherhood of It's [sic] People." Back in America, the original Rocky statue was initially commissioned by Sylvester Stallone in 1980. Sculptor A. Thomas Schomberg of Denver, Colorado, created the statue. It stands 12 feet 8 inches from the bottom of the pedestal to the top of the boxing gloves and weighs 1,400 pounds. Sylvester Stallone with his Rocky likeness in Philadelphia at the 2006 ceremony. Two other large Rocky statues were also created by Schomberg. One was reportedly installed in the private collection of Robert Breitbard of San Diego, California, a local football hero and former high school classmate and friend of baseball great Ted Williams. Breitbard, a successful local businessman and sports enthusiast, built the San Diego Sports Arena in 1966 and also created the San Diego Hall of Champions Museum where his Rocky statue is housed. However, this Rocky statue was reportedly acquired by Sylvester Stallone for $400,000 in December 2017 after the San Diego Hall of Champions closed. A third large Rocky by Schomberg was also planned but not cast, as it was listed on eBay at various times in 2003-2005, being auctioned to raise funds for a proposed International Institute for Sport and Olympic History at State College, PA. The eBay notice initially listed a starting bids for the project, but it is not known if the third Rocky statue was finally cast and/or sold. In addition to the monument-scale Rocky statues, a number of smaller replicas were made available for purchase through a collaborative venture between Schomberg and MGM film studios. In 2006 at the 30th anniversary of the first Rocky film, two smaller sizes of the Shomberg Rocky were made available: a 12-inch sculpture cast in resin and hand painted for $98; and a 20-inch sculpture cast in resin, bronze plated, and hand painted at $468.00. In addition, a limited number of the 20-inch sculptures, cast in traditional bronze and mounted on a black marble base, were also made available, signed and numbered, at $2,600.00 each. There are also smaller, desk-top versions of the Rocky statue available on-line through various vendors. The Rocky name and business franchise, meanwhile, have done quite well over the last 40 years. The seven Rocky films alone have had a worldwide box office of more than $1.3 billion, with about half of that generated in the U.S. Rocky IV, with its $300 million global box office, is considered the most financially successful sports film of all-time. And with Creed holding its own in 2015-2018, the series appears to be maintaining its momentum. In addition to box office revenue, there is probably at least another $100-to-$200 million from sales of books, soundtracks, DVDs, video games, and other Rocky-related merchandise over that same time period. Rocky music and the film soundtracks, all by Bill Conti, have also done well. The main theme song in the 1976 Rocky, “Gonna Fly Now,” hit No. 1 on the Billboard Hot 100 in early July 1977. Given the uproar and long-running debate that occurred in Philadelphia over the appropriate location of the Rocky statue – with the Philadelphia Art Museum location being at the center of that storm for some 20 years – it is interesting to note that in March 2014, the museum served as the host location for a cocktail reception and special screening of the latest edition of the 1976 Rocky film (see invitation below). In early 2014, Twentieth Century Fox released a brand-new 4K Blu-ray set of the Rocky movies — The Rocky Heavyweight Collection — and to celebrate, the Philadelphia Museum of Art opened its doors to Rocky fans for a special screening of the film and reception with the film’s director John G. Avildsen. March 2014: Invitation to a special screening of the 1976-77 “Rocky” film at the Philadelphia Museum of Art. 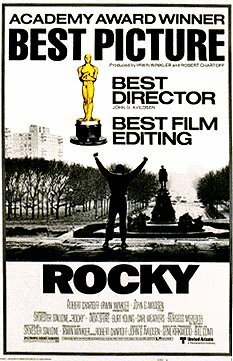 Rocky I poster with updated Academy Awards. Meanwhile, in Stallone’s latest installment in the Rocky film series, Creed (2015), the two main characters – Rocky (now a manager), and his boxer charge, Adonis (Donnie) Johnson – after returning to Philadelphia, make their way up the Philadelphia Art Museum’s steps to gaze out on the city’s skyline. …Stay tuned, Rocky is still in the building. Poster from the first 'Rocky' film, 1976. Click for wall poster. Clark DeLeon, “The Scene,” Philadelphia Inquirer, March 16, 1981, p. D-2. W. Speers, “Stallone Resurrects That Statue Matter,” Philadelphia Inquirer, January 9, 1990. Clark DeLeon, “Statues: Readers Rage Over Rocky,” Philadelphia Inquirer, February 21, 1990, p. B-2. Mark Fazlollah, “Statue of Rocky to Leave the Art Museum – Again,” Philadelphia Inquirer, February 25, 1990, p. B-3. Gloria Campisi & Mark McDonald, “Steps in the Right Direction, ‘Rocky’ Going Back to Museum, but Not to Famous Spot,” Philadelphia Daily News, May 11, 2006. Stephan Salisbury, “Comeback for Rocky Statue,” Philadelphia Inquirer, May 11, 2006. “‘Rocky’ Statue May Fight Again,” Los Angles Times, May 12, 2006. Editorial, “Has Rocky Found a Home?,” Philadelphia Inquirer, May 12, 2006. 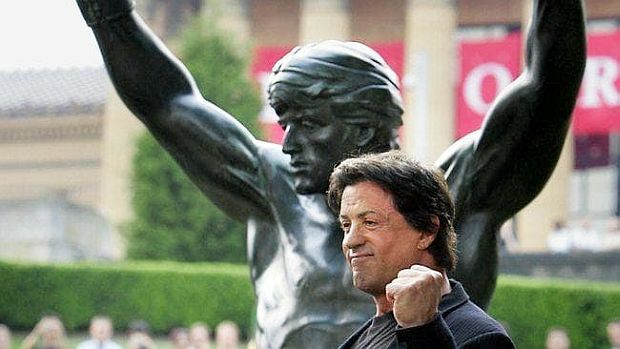 “Philadelphia Officials Reject Rocky Statue for Art Museum,” CBCNews.ca, Friday, August 4, 2006. Poster from the film, 'Rocky IV,' 1985. Scott Weinberg, “Rocky Wins Battle With Snooty Art Critics … Kinda,” Cinematical, August 24, 2006. “Rocky Statue Returns to Philadelphia Art Museum,” CBC Radio, Canadian Broadcasting Corporation, Wednesday, September 6, 2006. Editorial, “Rocky’s New Home,” Philadelphia Inquirer, September 9, 2009. “Rocky: The Monumental Statue,”Schomberg Studios.com. “Rocky Statue on eBay,” Posted by David Pescovitz, May 29, 2005. Stephan Salisbury, “Will City K.O. Rocky’s Bid for O.K. ?,” Philadelphia Inquirer, August 3, 2006. Clark DeLeon, “Obstructed View of Rocky,” The Daily Deleon, September 9, 2006. Poster from the 6th Rocky film, 'Rocky Balboa,' 2006. Associated Press, “Rocky Statue Headed Back to Museum Steps; Philadelphia Art Commission Votes to Return Boxer to Original Locale,”MSNBC.com, Wednesday, September 6, 2006. Michael Vitez, “Stallone — and Thousands — Cheer Rocky Statue,” Philadelphia Inquirer, September 8, 2006. Joann Loviglio, Associated Press, “Rocky Balboa Statue Causes Controversy,” September 14, 2006. Robert Strauss, “Rocky Statue Makes Comeback at Museum,” New York Times, November 19, 2006. “Serbian Village Venerates Rocky,”BBC News, February 12, 2007. “Rocky Statue Draws Crowds in Serbia,” Independent Television News (U.K.), Sunday, August 19th, 2007. Associated Press, “Serbian Village Gets Rocky Statue,” USA Today, August 20, 2007. Daniel Rubin, “Piece Of The Rock,” Blinq. The Philadelphia Inquirer, November 5, 2006. Michael Vitez (author),Tom Gralish (photo- grapher), Sylvester Stallone (foreword), Rocky Stories: Tales of Love, Hope, and Happiness at America’s Most Famous Steps, (Paperback), Paul Dry Books; 2006, 144 pp. “Running in Rocky’s Famous Footsteps,” National Public Radio, November 22, 2006. Karen Heller, Philadelphia Inquirer Columnist, “Rocky – The Movie – Finally Makes it Inside the Art Museum,” Philly.com, March 13, 2014.